The previous examples show that there exist many bee-pollinated plant species in which sophisticated mechanisms are involved in pollen presentation, pollen dispensing, and/or pollen transfer. In the present paper, we focus on the staminal lever mechanism found in sages (genus Salvia). Form, function, and ecology of flowers of the genus Salvia have been recently reviewed [20,21]. 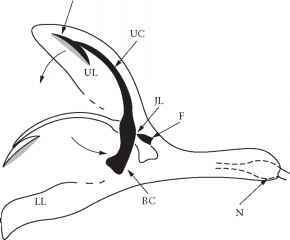 We therefore only summarize briefly the basic morphological and biomechanical parameters of the Salvia flower and its staminal lever mechanism, which are important for our studies. Flowers are sympetalous and mainly bilabiate with an upper and a lower lip (Figure 6.1). Four stamens are usually formed, the upper (adaxial) pair being reduced to small to minute staminodes and the lower (abaxial) pair forming the lever mechanism. In each stamen, the lever arms are formed by the extended connective that is fixed to the filament by a miniature joint-like ligament. The lower lever arm is sterile in many species, while the upper one is always fertile, producing one theca. The two stamens are often partially fused, thus forming a functional unit. Pollinators in a "typical" Salvia flower push against the base of the sterile lever arm (BC in Figure 6.1), causing a swing of the lever around the jointlike ligament (JL) so that the visitor is touched by the pollen sacs located at the upper, fertile lever arm (UC) and becomes loaded with pollen on its back or head. In later flower development, stigmas are generally orientated to occupy the same position as the previously functional pollen sacs. A pollinator carrying pollen delivered from the staminal levers is therefore likely to transfer the pollen to the stigma of a flower of the same species. corolla tube in mind, there are two different mechanical exclusion mechanisms possible: (1) the length and diameter of the flower tube might be an important factor in restricting access to the nectar [24,25, ClaBen-Bockhoff and Kuschwitz (in preparation)], and (2) flower visitors that are not able to move the staminal lever may be mechanically excluded from the nectar by this rigid barrier [21,26]. The methodological approaches we have developed allow for a quantitative measurement of the forces insects are able to exert while gaining access to an artificial nectar source. The methods we have developed allow us to measure (1) the forces that insects are able to exert while gaining access to a custom-made artificial nectar source (Figure 6.3), and (2) the forces necessary for insects to trigger the staminal lever and to force themselves along the corolla tube towards the nectar source (Figure 6.4). 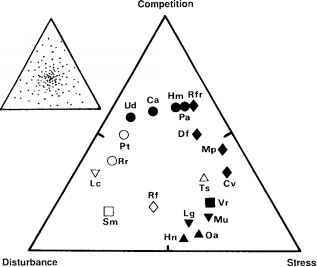 This enables us to test the different barrier hypotheses and to reconsider the functional importance of different flower structures for flower-pollinator specialization.